Okay this is going to be very hard to believe but SUSHI is one of the easiest things I’ve ever made in my kitchen. So you know that means? I’m hooked. 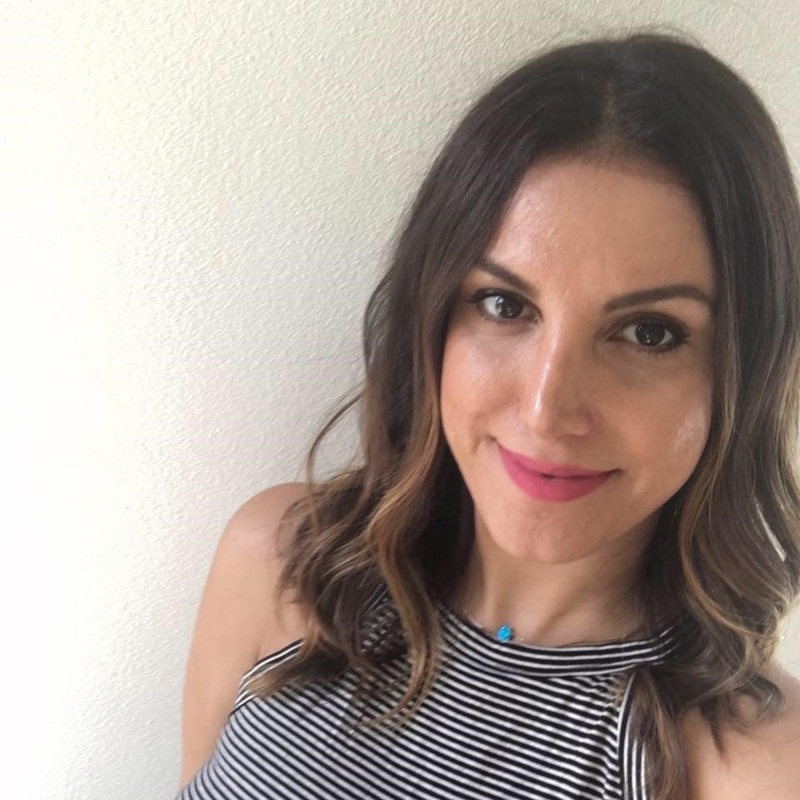 You’d think that going on a vegan or vegetarian journey would be tough but I find myself still enjoying all the things I did before, without any of guilt. One of those things is sushi. I thought I’d only ever be able to order an avocado roll but I’ve proved here that when you get a little creative, even sushi nights can be exotic and exciting. 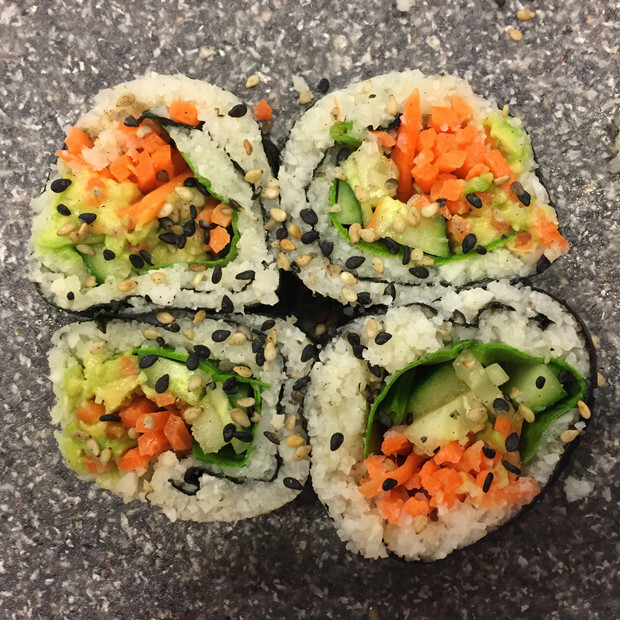 I’m going to share this Cauliflower Rice Veggie Sushi recipe with you because it’s low carb, full of nutrients, and so very very filling! Feel free to take this secret and make it your own using brown rice, forbidden (black) rice, wild rice, quinoa, or even cous cous if that’s how you roll. Veggie Sushi doesn’t have to be boring anymore!! 1. (You can actually skip this recipe if you want to keep it fully raw) Cook the cauliflower florets in boiling water for about 2 minutes, just to soften them. Drain and rinse with cold water to stop the cooking. 2. Pulse the florets in a food processor gently to get a rice consistency. Be careful, you don’t want cauliflower mash. 4. THE SECRET REVEALED: mix vinegar, sugar, & salt in a small bowl. Add this mixture to the cauliflower (or any sushi “rice” you choose) and that’s what will make you feel like you just walked into your favorite sushi restaurant and ordered your favorite sushi roll. 6. I’m not going to take you through the rolling process but I’ll tell you that it is SUPER easy. I learned it watching a YouTube video. You can too! 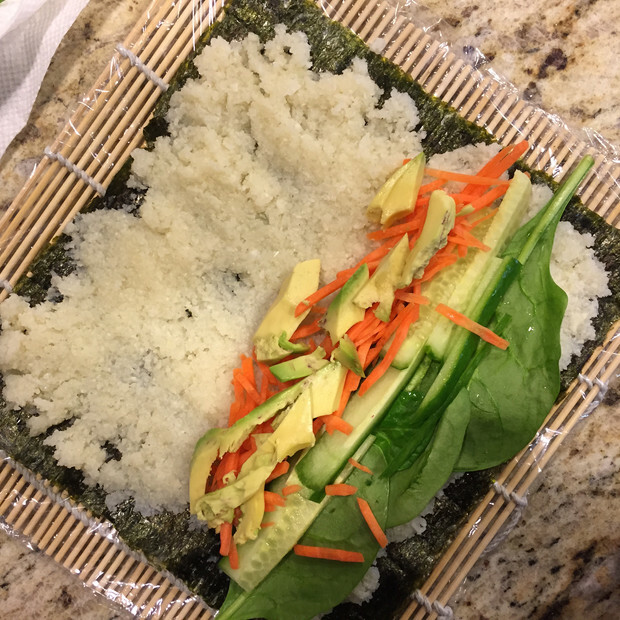 ProTip #1: When using the Cauliflower “Rice” cover your seaweed only halfway (unlike the picture) the Cauliflower moves with the roll and will push over the edge if you add too much like I did. ProTip #2: Cover your sushi roller thingy with cellophane wrap to keep it clean for next time. Just toss away cellophane when you’re done and voila, ready to go! Basically now you just roll everything up, slice it with a VERY sharp knife. 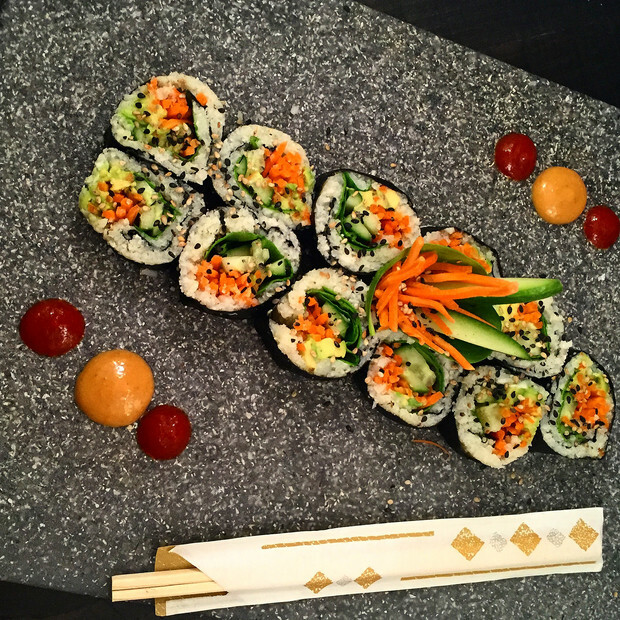 Add sriracha, spicy mayo, black sesame seeds, soy sauce, or nothing at all and have a VEGANLY wonderful SUSHI NIGHT!